The KODAK Video Monitor CFH-S10 brings you closer to the people, places, and pets that you care about—no matter where you are. Check in on loved ones with smooth HD streaming video, crisp two-way audio, and automatic night vision using the free iSecurity+ app (iOS, Android). 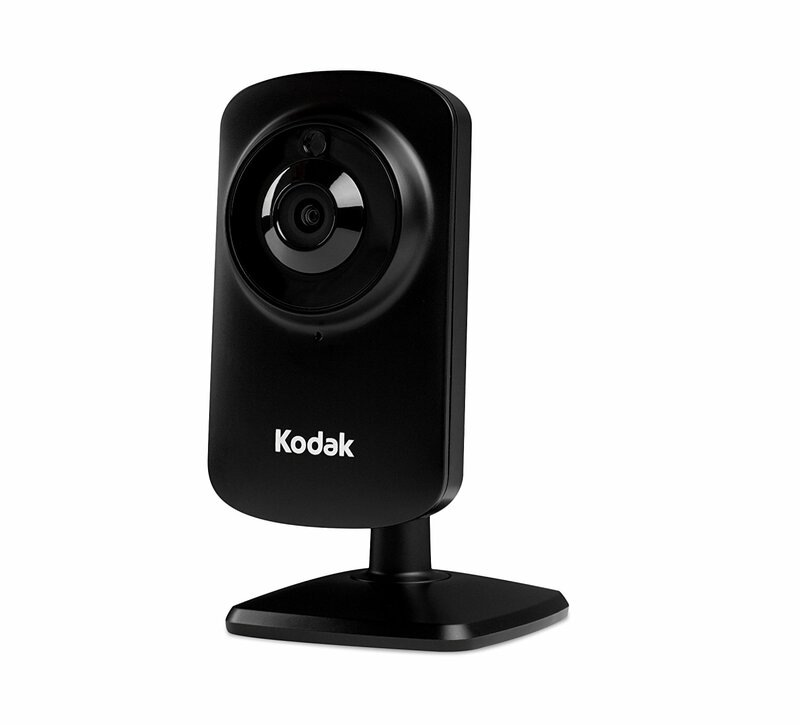 Equipped with motion detection, the KODAK Video Monitor CFH-S10 automatically records and stores video clips in the cloud for last 24 hours* and sends mobile notifications to your smartphone or tablet so you know what’s going on (premium storage and smart detection plans available for purchase). 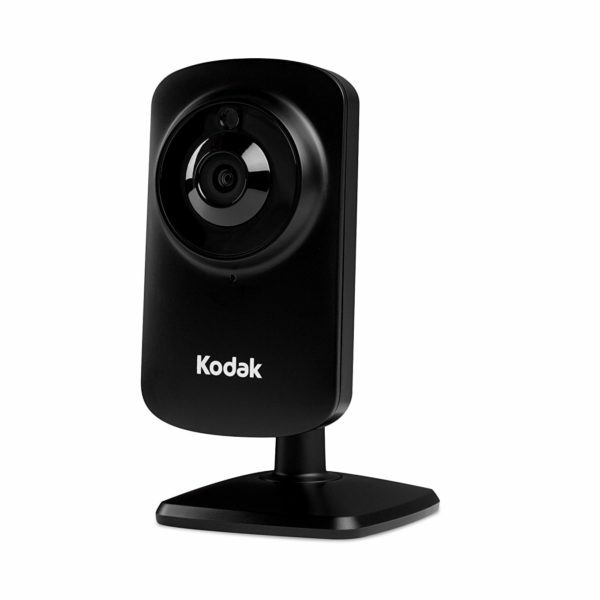 Internal antenna expands your existing home network coverage, and integration with the IFTTT (If This Then That) iSecurity+ Channel lets you connect the KODAK Video Monitor CFH-S10 WiFi camera with other devices or apps for more automation. With the KODAK Video Monitor CFH-S10, you’ll always stay close to home. Playback recorded motion-triggered video clips—store in the cloud—from the last 24 hours*. Now all KODAK S Series cameras include Lifetime 24 Hour Cloud Storage so you can rest assured that you’ll never miss a moment. Connect any KODAK S-Series camera to the IFTTT (If This Then That) iSecurity+ Channel (ifttt.com/isecurityplus) for added functionality and features with other devices or apps. Dozens of iSecurity+ “IF” and “DO” recipes let you set automatic triggers or actions—such as enabling or disabling motion detection based on GPS location or aiming your camera in a new direction. Like this cam, easy to install, easy to use, especially worth it with the free 1 day event storage, surely will recommend to friends. Got this several days ago, it’s the best camera I have ever used. The camera lenses is very good and real time graph is beautiful, no any delay in P2P mode. I might consider getting another one for my sister. Taking a trial for its premium service, motion detection is really good feature, I got notifications when events happen in front of my camera, and just one touch to review several seconds video clip for events, that’s pretty cool. Excellent product. Does exactly what it is advertised to do. Set up is a breeze. I am really impressed with the sensitivity of the microphone. 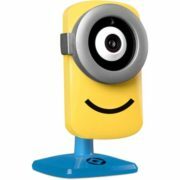 It picks up conversations from other rooms in the house! Kodak’s V10 camera works great. The most features and function for the price by far. This camera is in our living room on a shelf in the corner and the wide viewing angle lets us see all walls (important to us as we have art) with crystal clear clarity. There is almost no delay like we experienced with other cameras (ahem, DropCam). Super simple to install when we brought it home. We have recommended this camera to many friends. I got this camera to use for home security and I am very happy with this product. The camera was very easy to install and set up, it didn’t take long at all. The quality of the video is excellent and very clear. It has a built-in microphone and speaker, I can actually project sound through the camera from my phone remotely. I would recommend this camera to others! I received the cam and thought it would be your standard grainy webcam. This device streams very clearly with very quick and easy set up. Anyone looking for a nice security cam for a good price should check out this one. I’m thinking about adding a few more to my setup. – Very easy to set up and uses wifi. – Comes with a iSecurity+ app for iPhones and Androids. The iSecurity app is pretty easy to use, but it has a few bugs that I’ve encountered. You can live stream, zoom, and record events with the app. – The camera has a built in wifi range extender that you can turn on, however, I have not tested this out yet since my router already covers the whole house and outside. – Not waterproof. I park my motorcycle in front of the house. I’d like to use it as a security camera outside my house to record illegal activities if something happens. Great product. Works so much better then others I have tried. I’m very surprised that I didn’t have any problems.Easy quick and simple.The cloud is kool. You don’t need a memory card. Great quality camera! Gives me a piece of mind when I’m not at home. Highly recommended! I recently purchased the Kodak CFH-V10 video monitor from Wellbots and I love it. This is a great and inexpensive option if you are looking for a security camera. I have used the camera for about two weeks now and have nothing but positive things to say about it. The camera is very easy to set up and use. While I am at work I can connect directly to the camera with the iSecurity app on my iPhone 6 (the app is also available for android devices) to watch my dog while I am working. The video quality is great for a camera in this price range. The video feed through the app has about a half second delay, this is my only complaint about the camera. One of the coolest features of the camera is the night vision mode. It switches to night vision seamlessly once it detects the lights are out. The quality in night vision mode is superb. I have no complaints about the sound quality. Overall the camera is great and for the price you can’t go wrong. This camera is super easy to set up and use. I took it out of the box and had it functioning in 5 minutes. Color and night vision is tremendous. I like that I can snap a still picture of the camera directly from the iPhone app. This is useful for home security, watching a pet, or keeping tabs on cleaning staff. Highly recommend! This camera is great. The setup was quick, and as long as your internet is moderately fast you should have no problem with the live streaming. It also comes with 24/7 cloud which is awesome for quick review (Luckily, nobody broke into my house since I’ve had it, so I haven’t had to use this outside of practice). I would probably recommend fast DSL or Cable however, since this entire thing runs off wifi (you don’t plug it into your computer ever). That being said, the picture quality is great, and for the price you can’t beat the performance. I originally ordered this camera through a different site (Wellbots), but was unable to review it there. Overall it’s a great buy for the price. We recently had a break in. I installed an alarm system but before that bought this camera because of excellent reviews, no need to buy a plan, remote (cloud) storage rather than local storage of images/videos (rather than burglar taking the camera with the evidence with him and use my camera to monitor his unlawful gains from other burglars, burglar-burglars, so to speak). Set-up and syncing with my i-phone 5S was done in under 10 minutes and was essentially fool-proof. I have been able to monitor my front yard in very good quality real time this morning and have taken good quality pictures of persons and vehicles in my front yard that I am sure could easily be enhanced by police if need be to see details more clearly. That said, details on the images are very satisfactory and more than adequate for identification (remarkably superior to any of the footage of store robberies you see on TV). Voice communication works very well both ways with about a 3 second delay, which is not a problem at all. I have ordered the Kodak CFH-V-15 so I can get an even better field of view by panning and tilting the camera 360 degrees and up and down to be able to look inside the house if necessary (in other words, get the whole thing on camera: approach to the house – break-in – search of the house – exit with my stuff…perfect sequence of evidence). Now I have to convince my family that I am not paranoid. (I bought this product for the regular Amazon price and have no affiliation with Kodak). It has it’s ups and downs, but overall it’s a great little camera. It does exactly what it claims, and has put a lot of my anxieties at ease. I like the look and feel of it, and setup was insanely easy. I’m using it with a 2nd gen Nexus 7 tablet and the app runs like a charm. I’ve included video screen capture for those curious as to exactly how the viewing portion works. -Insanely easy setup. Literally all done within minutes. -Lightweight, good design, and the neck swivels and rotates very smoothly. -The two-way microphone works great, and is personally my favorite feature. Being able to leave my nieces unattended for a couple of minutes, and keeping the ability to talk to them from another room is priceless. -The ability to smoothly zoom in and out. -As mentioned in a lot of reviews, the unlimited 1-day cloud storage is an AMAZING addition to this purchase. I can not only check it live, but come back and review it later. -Definitely not the best quality. -The wifi is obviously a great feature, however it’s the number one thing that will go wrong. There is no way to remotely control it (as the switches are on the camera itself) so any hiccup in the internet will cause this to dissapear from the app. Once it’s disconnected it has to be manually reconnected. This can be a problem if you plan on using this away from home. Overall if you’re looking for a well priced home, child, or pet monitoring device, look no further. However if you’re looking for serious equipment for home security you may want to pay the extra money and go for something meant to do so. I personally love this thing, and have used it daily since I recieved it. The Kodak Video Monitor does all it promises and does it well. This product should be more than adequate for anyone seeking a simple video monitoring solution. It is built very well and transmits very clear 720p video. The camera itself feels very solid and well made. The material while plastic feels premium. It comes mounted on a stand and it is very stable when on a flat surface. It can also be mounted to a wall and it includes screws for you if you wish to do that. The setup was quick and painless. It is done through the smartphone app and just requires you to make an account and type in your wifi password. The video is decent HD and the frame rate is good enough for most monitoring purposes. The video is transmitted to the app with very little delay and the zoom works fine. What really makes this camera great though is the free 24 hour backup. Once you enable this feature the next 24 hours are saved to the cloud. I tried this a couple times and had no problems either time. The one gripe I have is that the app is the only way to view the camera feed. It would be nice if there was also a website to use. Overall this is a well built camera with good video quality that requires little effort to setup. Setup was relatively easy and the picture is good, but the camera doesn’t seem to work with standard programs like Blue Iris, which I use for everything else. 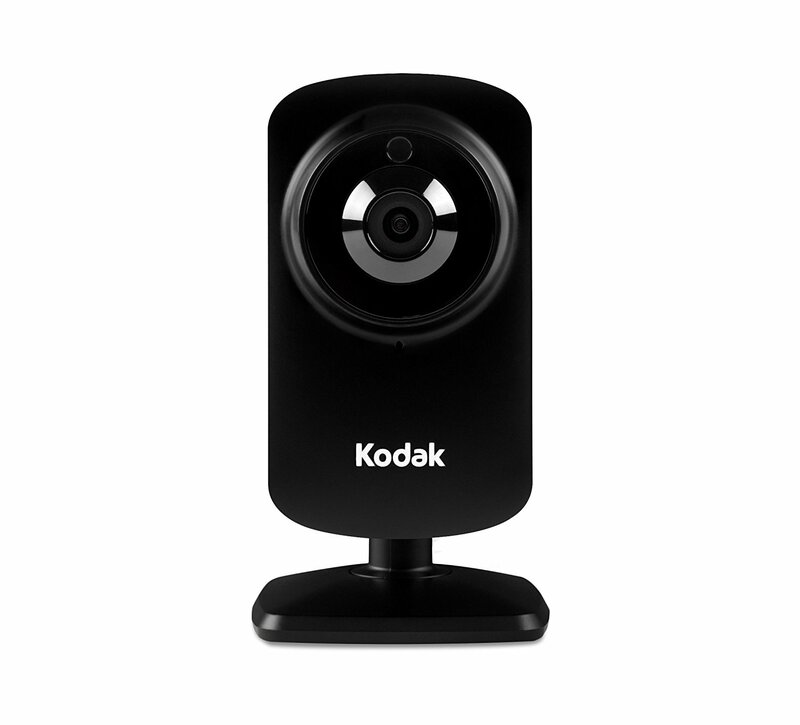 The Kodak CFH-V10 is a wireless IP camera with 720p video output. The camera is attached to a ball-head and can be mounted on a wall. It includes the screws. You can rotate/move the camera head to any angle that you like, after that the camera has a fixed position, so after the setup you can’t move/rotate the camera. The power input is a standard 5v/1A, so you can either use the included adapter or use any other 5v/USB outlets in the house. The camera is configured and monitored through an app named Security+, which is available for free to try/download in the App store. Setup is very straight-forward, quick and easy. Using the app, you can connect each camera to the internet and monitor them online anywhere. You can also take pictures, record video and listen/talk to each camera (the 720p video output is not enabled by default and has to be enabled in the app). Furthermore, the camera stores 24-hours of the stream on the cloud, therefore there is no need for local storage anymore. 1-day is of course is not enough for a week-end or longer trip, but Kodak is offering 2-week online storage for $10/month. The cloud-storage is free, which is a very good deal. The downside is you need a smartphone to operate the camera. Also the app is very out-dated and could use some UI overhaul. You can share a camera with friends in the app. Also there is a motion-detection feature that sends you notification when there is a motion. The camera produces a crisp and sharp 720p video output at an acceptable frame-rate. The viewing angle is normal (it is a wide-angle camera). The output quality is very good both is day-light and low-light. In low-light, the camera uses IR sensors to paint the subject and produces a 720 b/w video, which works great, but if the subjects are too far, they can’t be painted and they won’t show-up in the video. The camera comes with a microphone and a speaker. You can listen to the camera through the app and/or talk to it. Overall, I highly recommend this camera. If you want a security camera that is super simple to set up and super easy to use, then get this. I opened the box to find the camera, the power adapter, and the owner’s manual. There wasn’t a multitude of wires or any other confusing parts. 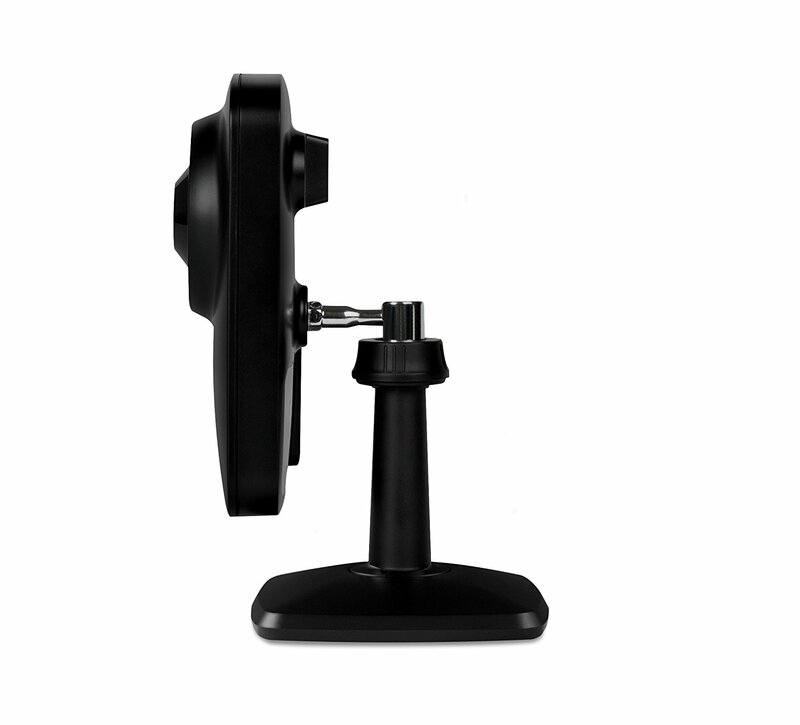 It is lightweight, small, discreet, and it even comes with screws if you want to mount it on a wall. The night vision and audio talk back features are not only great, but they are useful too! I use it for security but also to watch my dog at home while I’m at work. He knows he’s not supposed to jump on the sofa but when I’m away he sometimes does. I can easily say “No!” and “Get off the sofa!” and he will hear my voice. The picture quality is not extremely crisp but it is not bad considering you are live streaming onto a mobile device. The Internet connection seems to also affect the quality and smoothness of movement. Be sure to have fast connections at home and your smartphone. Overall, this is a very handy device with great features that are very useful. It takes a lot of worry away when you are stuck at work or are going on vacation. One feature that I would have liked to see on it would be some sort of weather proof enclosure so that it could be placed or hidden somewhere outside if you want to monitor outside of your home. But for the price, I couldn’t ask for anything more. This unit is difficult to adjust for the right sensitivity. It is very inconsistent sending notifications. Notifications to e-mail does not work. Would not recommend this. For the price and build quality, this camera makes me feel secure and within budget. The camera blends in well with my surrounding area and is small enough to be almost unnoticeable. Setup was a breeze for me, and I am glad that Kodak decided to use my cell phone as a monitor. It makes it extremely convenient when out of the house. The app is not the prettiest but it is easy to use. The notifications, and the ability to pan and zoom on my phone is fluid. Another plus is the free 24-hour backup, you cannot beat that. However the picture quality is not the best it is respectable but not what I would consider HD. Every now and then when there is a lot of movement or network activity, I can get clarity issues. Otherwise, I was satisfied with the image and video capability. The two-way intercom is cool and useful, but the noise can be tinny at times. Overall, I will definitely be using the V10 to keep an eye on the dog and small kids. The picture quality and WiFi reliability can vary but it is handy tool and for the price and relief of heart, I am really happy with it. 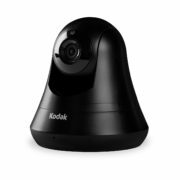 Kodak has provided a number of enhanced monitoring services at different price ranges unlike Belkin. I compare the two because Belkin uses the same iSecurity outfit and only has the $9.99 per moth per camera option. Both companies lack the recognition that some customers may want a multi camera account and a discount for multiple camera with the net service. iSecurity states it is up to Kodak and they too seem to want to chase away multi camera accounts. It turns into a big monthly payment as Samsung is understanding with their new system. So here is some pressure iSecurity. It’s a great little camera. It does exactly what it claims. It has a nice look and feel, and the setup was insanely easy. I’m using it with an iPhone 4S and the app runs well. – The ability to smoothly zoom in and out. – The unlimited 1-day cloud storage is a great feature. I can not only check it live, but come back and review it later. – It connects via wifi and doesn’t have backup power. If the power or wifi goes off, then you have to manually reconnect the camera. This can be a problem if you plan on using this while you are away from home for a long time and need to monitor the house. In that case, you might want to get something else. – They have apps on google play and Iphone, but if you use a Fire Phone or some custom android, then they don’t have an app on the amazon app store. They could just give the google play file for download and I can install it on my fire phone. I didn’t see an option to download the apk file. I received the product for free in exchange for an honest unbiased review. Works great! Very easy to install. I will be ordering more! Went out a couple of times but not for long. I am pleased with the clarity of the camera day and night. I would recommend it. The camera is of decent quality and works as a basic video monitor. I use this primarily to keep an eye on baby when I’m out of the house but, as it is not remotely controllable (to pan in different directions), it’s not the best item for that. You have to stand directly in the line of vision to be able to be recorded. Ideally, this is meant for stationary mounting to view one location — I’ll likely end up mounting this outside of my home to record visitors since I don’t have a peephole. The motion sensor is great for that purpose. I like that it has coordinating apps for Andrios and ios and both have worked seamlessly for me. Disclaimer: I received this item for free in exchange for my honest review. These Kodak monitoring cameras definitely keep up with the competition for a fraction of the price. I have these all over my home and have even placed them in my family member’s homes and they can all be seen from one app. Very user friendly. Picture is great. I like the microphone option which has helped comfort and spook the sitters. I set it up to send me a text message when I’m not home to show movement. It works! Also has cloud storage. I’m a fan of these cameras. These are stationary but work great. Will definitely be recommending and purchasing more. I’m not paranoid. I just like to be aware. needs the ability to adjust more options settings, but works fine. A few weeks ago, I was with one of my neighbors at a gathering when their home alarm went off. The point of activation was the back door and they were quite alarmed (pun intended) and rushed home which was about 30 minutes away. When they received the notification, the first thing I asked was if they had cameras and they did not so they could not see if anyone was inside or if this was just another false alarm (which about 98% are so many police departments are no longer even responding to them any more which makes sense IMO). After this, I decided to get a camera for my home as many alarm companies had been offering them to supplement residential alarm systems and many of my co-workers had them already but generally at a premium. Overall I am very happy with this purchase. After reviewing numerous wifi cameras here (and there are oh so many), I wanted to 1. stick to a name brand that I knew and was comfortable with and 2. something simple and easy (Can you say, “Set it and forget it”?). I wanted to wait until after a few weeks to give a review of this item. First there are very few parts in the box which is a good thing. I-Phone app setup took about 5 minutes max. It was so simple! It took longer for me to pick out where to set it up and then how to mount it for the best view. The power cord may not be long enough for some people but I found a perfect place for mine. I ended up mounting mine on a wall to give a better view from up above as opposed to the base swivel mount on the normal base is limited to its downward trajectory mainly because of the rectangular head. The only con I have found so far is that on the phone app, you cannot review old footage. On the app, you can only view live feed, record, photo, listen in and talk back. In order to review past video, you have to go to the website which isn’t a big deal but something worth noting. I went with the free 24 hour recording and for my purposes, as that is all I need for my purposes. You can also upgrade (i.e. 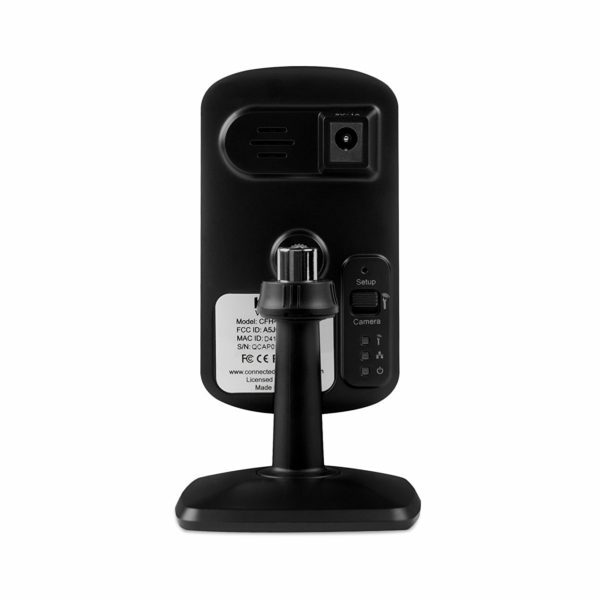 pay) for longer camera storage footage or motion activated notifications. It should be noted that it only keeps video when there is motion or at least that it all I am getting when reviewing footage. As to the video quality, I was at first skeptical of the non-HD/ 1080p video which others have but after use, I am actually quite satisfied with its quality. The night vision is also quite good along with the audio. I bought this camera for piece of mind while I am not home and to capture anything should something happen. Alarms are great but they have their limitations and are notoriously faulty. Having a camera is much better IMO and with this one there is free 1 day cloud storage (with audio) and no memory cards to mess with (or be stolen with the camera) or DVR’s or a million cables. After about two weeks the camera has been stable and produces a great looking image at a reasonable frame rate. The viewing software seems to work well across various platforms (unlike the D-Link software for another camera I bought that is very buggy on a PC). My big complaint is that when you log in to your camera you are connected for only five minutes, then the connection drops. I’d like to be able to pull up the image on a PC at work and keep tabs on my home. Of course, you can reconnect, but it’s a bother. I suspect they do this to keep bandwidth down, but no where in the description of camera and software is this noted. If you bought a car and it shut off every five minutes, you wouldn’t be happy, even if you could restart it immediately. Was working like a charm, until I updated the firmware. Immediately after that, the lag, which was barely there before the update, got realllly bad. Like 10 whole seconds. It is the same whether I view through my Galaxy S6 or on their official website. Really wish I could roll back the firmware. I will update my review if they fix this. I have VueZone, D-Link and Kodak. Kodak has the best image quality, was easiest to set up, and has free cloud storage. This is the best of the three. Love this camera! It was incredibly easy to set up, sends you notifications when movement is detected complete with saved video clips for free, and you can talk through it to whoever’s on the other side, which is great for messing with my girlfriend. I feel much safer having it in my house. This camera works really well, and the 24 hours of free playback is awesome! We wanted to be able to see what our dog was doing while we were gone, and also have this camera for security purposes. Luckily, we haven’t needed to playback anything for security reasons, but it is nice being able to check up on the house from anywhere. It gives peace of mind that the house is still in tact while on vacation. The phone interface is really easy to use and you can even save clips to your phone if you need to. All in all a great product with great service! I purchased this to provide indoor security when I’m at work or traveling (based on motion detection) and also check in on my cat. I recommend this camera. – Great quality of videos. Awesome wide angle, great night vision. – Motion sensor works really well. Its triggered by my cat, wife, lights etc. You can change the sensitivity to where my cat does not trigger it as much, although I wish the sensitivity had a bigger difference between max and min. – Can be used to easily view contents through the App when away and to speak to someone on the other end! – Seamless set up through the App. Took no time at all. – Smart: It records constant and deletes, so when you set motion detection and it captures an event, it records and uploads the video snipped a few seconds BEFORE the trigger. This way, you dont miss out on anything! – Decent looking but could be smaller so it would be more obscure. – The app is good, but could be better. I would like to find a way to delete all the recorded videos in one shot rather than one by one. – Voice communication is of poor quality – but for me it hardly matters. I want them to make an outdoor version that is easy to hide. High quality camera for a great price. Detection analytics is superb. I only wish that I could mount it outside. 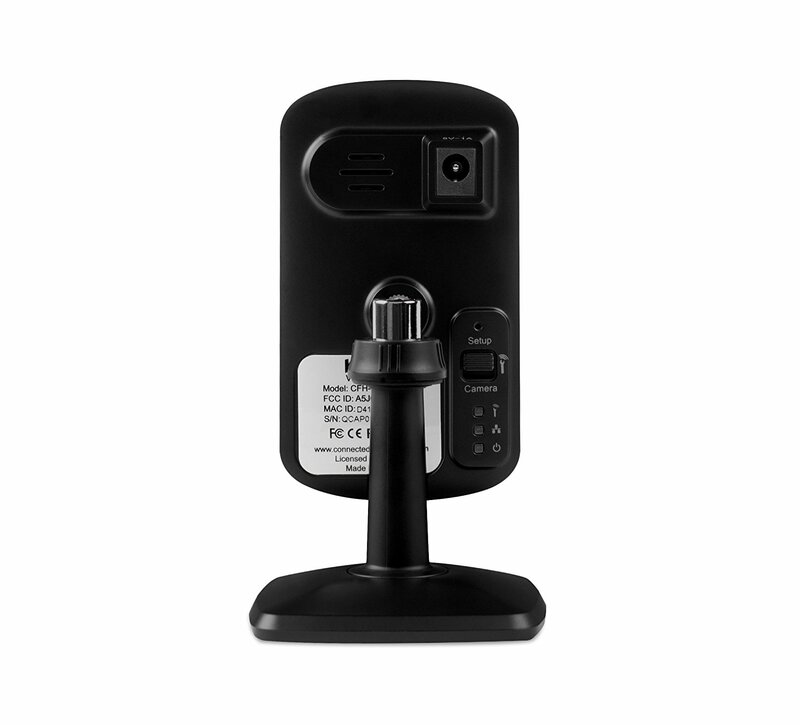 Great camera and easy to use application. I find I don’t use it because you have to turn it on and off manually, which is a pain. No scheduler available. Bought this on Cyber Monday because we wanted something to put into our dog’s room so we could watch them while we were at work. Plus it was nice to be able to monitor for security reasons. We have been really impressed the quality of video and how easy it was to install. We were so happy that when it came up again during the holidays as a lightening deal that I bought a second one. If I see it come up again next year on sale then I will probably buy a 3rd. The only con is that sometimes we lose connection but can’t say that is the camera’s fault or maybe it’s our internet. Good quality at night even. My husband loves this new toy. Works great, night vision in our garage is excellent. I’ve tried other brands. Some were so difficult to install I had to return them. Before the Kodak CFH-V10 I tried three others including the Logi Circle camera from Logitech, which is more expensive but easy to install and has a slighly better image. But at the time I owned it it didn’t offer free 24-hour web storage (though apparently it does as of 05-23-16). I now have three of these Kodak CFH-V10 cameras and also a more expensive Kodak CFH-V15 (same image quality, but allows remote pan, tilt, and digital zoom) . 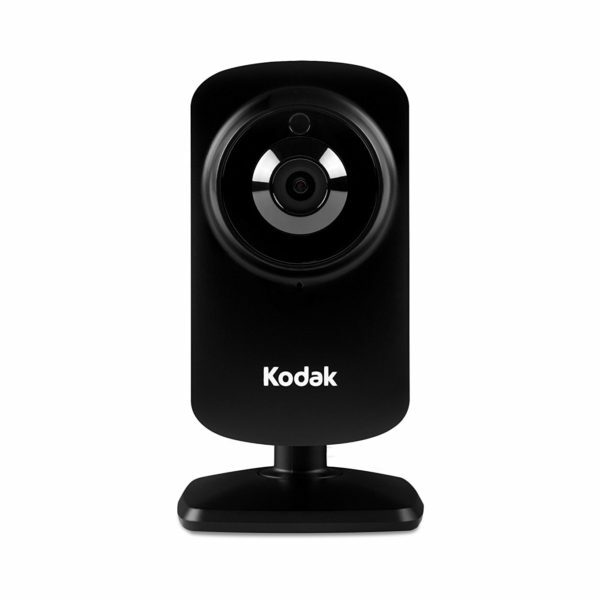 Installation of all of these Kodak webcams is quite easy, almost as easy as with the Logi Circle, using a free app called iSecurity+. 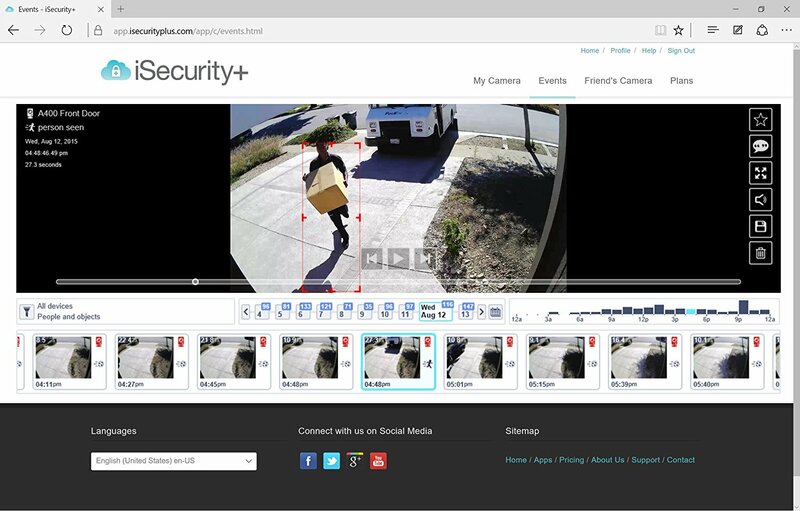 Image quality is fine, more than adequate for home security. I use the 720p setting at 5 frames per second on each of the four cameras, a frame rate that I think is good enough for security. Higher frame rates are available, all the way up to 30fps, but I’m conserving bandwidth so that Netflix can come through. One final comment — at current prices I can buy 2 or 3 Kodak CFH-V10s for the price of one Logi Circle. ‘Nuff said. I am a real buyer, no free samples. Setup is simple and straight-forward. App and online viewing and storage are super simple. Video quality is superb. 24 hours of free online storage. 5 stars. Nice little camera. Setup is so easy and installation is a breeze. Just wish you could somehow get the video to store on a harddrive. Maybe Im just too stupid to figure that part out. I am giving it 5 stars! I just returned a Wansview 1080 HD pro. What a mess that was! Poor connectivity, no manual, Chinese-English. Could not get features to work, etc. This camera blows the other one away! Very easy setup…..10 minutes. Although instructions were a little lacking, I was able to download the iSecurity+ software to both my iPad and iPhone. No real manual needed as this apple software was like any other iPhone settings. I got the motion detection working in a few minutes. NOTE that you iPhone will get a message of motion, but iPad gets nothing. Either way, no matter how far away I was, like at restaurant in another city, the app loads and you can view your camera in 10 seconds! It’s a beautiful thing! LOL. And watch the video of the motion it recorded…..with audio! Nice. I highly recommend this camera and I was NOT paid or given this camera. I bought it myself. Good purchase. Downloaded app for android, and it did not connect to WiFi for some reason. I am not sure if I had WiFi set correctly, but received call back from Kodak customer support and we were able to set it up very easily and quickly. Very good picture. I have it pointed at a window and am still able to see clearly in adjacent areas that are relatively much darker. I am very please with the camera. This was simple and does exactly what I need it to do. We were trying to catch out cat spraying, and having the motion detection instead of just one video recording to look through was much more convenient. There is a 30 day trial for unlimited day saves of your recordings, but I’m okay with just having 2 days worth of saves backlogged for free. I didn’t except the quality to be great, just needed it do to exactly what I needed it to do. I did notice that sometimes when changing from the infrared back to the regular camera the screen would stay pixelated. I tried many IP cams and finally bought a Kodak CHF-V15. It is very easy to install and worked very well. Since I don’t need the pan/tilt function, I bought this V10. It works great too. If you really care the user-interface, the Kodak cams are your choice. I set this up to sync with my ipad and home wifi (comcast). Set up was fairly straightforward. However I have had issues with intermittent connectivity problems where I get a “camera unavailable or offline” error message when I pull the app up on my ipad. Solution is I have to reboot the camera, then everything works again. If that occurred once in a while it wouldn’t bother me too much but it happens almost daily. Issue could be with the Isecurity+ app but regardless it’s a nuisance. When it works, it works great. Good night vision, sound, etc.